Cissus Rhombifolia (Grape Ivy, Oak Ivy) are fast-growing ivy originally found in the tropics. Because they are more tender than Hedera Ivy, Cissus make excellent houseplants, similar to Pothos. Your customers may like Cissus because the foliage has a shiny, florist quality. It looks great in hanging baskets, combo baskets, and stand-alone pots, but it could even fit well in some cut flower arrangements. Cissus are not hard to take care of because they are tolerant of low water and low light exposure and can thrive from 68-82 F.
For best results with Cissus, we recommend using a well-drained soil with a balanced fertilizer and a constant feed program of 200 ppm N. Maintain a pH between 5.5 - 6.5. A pH higher than 6.5 will show iron deficiency. Optimal EC using 2:1 Extraction Method: 0.6 to 0.9 Avoid overwatering. 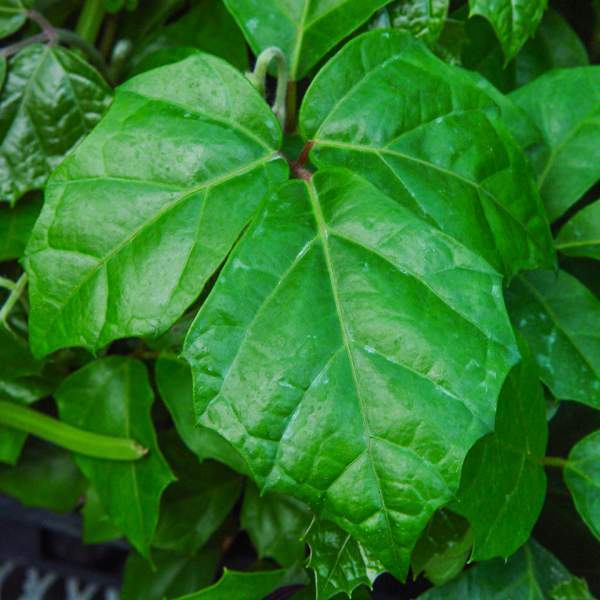 We recommend that you first pinch Tropical Grape Ivy 5-10 days after transplanting to your final container. Cissus should be spaced adequately to allow airflow and light penetration between the foliage. Usually 2’ centers on baskets will be enough. Aphids are the primary pests attracted to Cissus. Tropical Grape Ivy are not prone to many diseases, but watch for botrytis while the days are short. This grey rot is usually associated with wet or humid conditions. You can prevent botrytis by allowing the plant to dry out between waterings, allowing for good airflow in your greenhouse, and spacing to allow the sun to penetrate to the soil level. The most common chemicals used to treat botrytis are Medallion and Banrot. Use them as a drench according to each label’s instructions. Pinch Tropical Grape Ivy 5-10 days after transplanting to your final container. Additional pinches every couple of weeks may be required to shape your final pot.